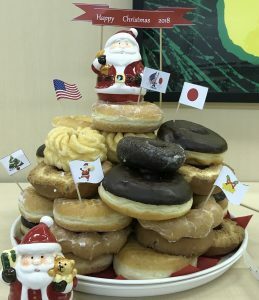 On December 20th, Happy Hour program “Christmas Party” was held at the AJS office organized by some student interns. 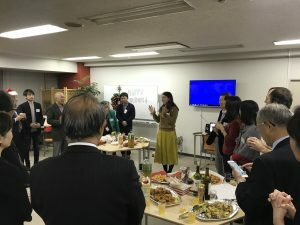 Many AJS members and guests took part in the event like last year. The party started off by having casual conversations among attendants while enjoying glasses of wine, pizzas, fried chicken, and so on. Then interns did a little quiz session about traditional Christmas in the United States with prizes for winners. We learned that Alabama was the first state in the US to make Christmas an official holiday, and that santa claus actually has a really long name for himself through the quiz. 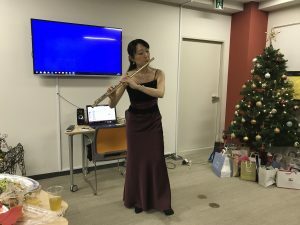 After the quiz, Ms. Yuko Iwakami, invited by AJS member, played the flute for all of us, and we loved how vibrant the sound was. We also enjoyed singing “White Christmas” along with her flute. At the end of the party, we made a circle and exchanged Christmas gifts we brought. It was very much fun to see what attendants got from who, and the party was closed with a lot of laughter and bright smiles. 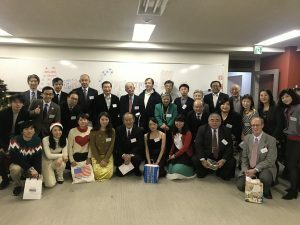 Considering the fact that all of us had a good time regardless of our age, the Christmas happy hour was a great opportunity to deepen our friendship among attendants.